This week we have an interesting assortment for you. 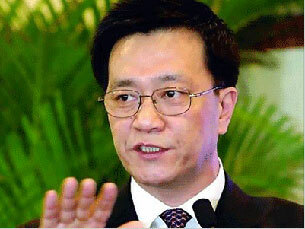 Before shutting himself up, an economist makes one last plea; the word to use to accuse someone who advocates change; China has a lot of “national secrets” and I bet this is one of them; the party asks you to oversee it, but you wonder how; a patriot defends his country, loud and clear; friendship cracks under fear; and what a Chinese luxury car looks like. Click date below for link to the original. 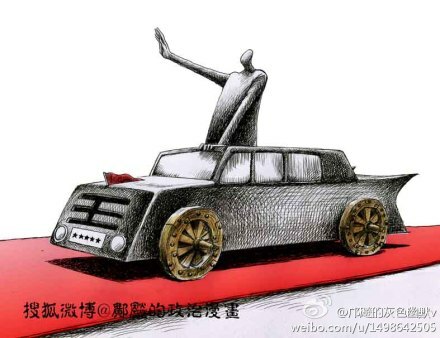 韩志国/Han Zhiguo/(Economist)/: 【 My last Weibo post: Without political reform, there can be no market economy 】 The essence of economic reform is to open up individual rights, whereas the essence of political reform is to check and balance government power. In China, the key is that there is no mechanism for protecting individual rights, and the government power has suppressed and violated individual rights too much, too deep and for too long. Absent of political reform, power will not be curbed effectively, the process of releasing individual rights will not be able to continue, and true market economy will not be possible. 冉云飞@ranyunfei/Ran Yunfei/(independent intellectual, renowned blogger)/: Every so often you are criticized for being “radical.” So triumphant is the critic that it is as though once the word “radical” is laid on you, nothing you have said is of any worth, the foundation of your argument collapses on contact, and you are defeated and dispatched. On the other hand, your critics never say a thing about the atrocities of the government perpetrated over decades, they hold no principles against it and have unlimited tolerance for it. They suffer from severe Stockholm syndrome without knowing it; they even feel complacent about this mental deformation. Frankie@zxd123/My own experience: This was in about 1992. On the days when executions were carried out, all the operation rooms were open at the affiliated Xinqiao Hospital of the 3rd Military Medical University, waiting for donors’ kidneys to arrive for transplant. At the Air Force General Hospital, it was about the same. 邓二晃晃@dc_b/: Tomorrow of last year, employees of the company where a friend of mine works were interrogated one by one by the state security police of Shenzhen (深圳), and it was because I used the company’s Wifi to go online the day before. My friend was so terrified that he broke ties with me. By T in Uncategorized on February 25, 2012 . Thank you, Yaxue, for caring about Chen. We will continue to fight for his freedom. Ms. Littlejohn is the president of Women’s Rights without Frontiers. Thanks! If you don’t mind, I am going to use Ran Yunfei’s quote from above and expand upon it a bit, albeit out of the context in which it was originally offered, in order to make a larger point. Thanks. And thank you (and Ms. Littlejohn) for the update on Chen Guangcheng. I hope that neither he nor his family end up as martyrs to this cause. A travesty for which those in power may find themselves in a worse situation because of the way in which he and his family have been handled. Of course I don’t mind, Chopstik. I assume that Ran Yunfei will be pleased that what he says has universality in it. He’s a great guy living in Chengdu (成都). He was arrested twice (for no particular actions on his part except for his writings). He used to call himself “Ran Fei” (冉匪, Bandit Ran), but he was mellow and now getting mellower. Why do I get a “ooops…” page when I click on your name? Isn’t it a link to your blog?